This article is meant to assist you with searching in extendedReach. If you have a question not addressed here, you can search at the bottom of this article in Related Topics or your can Contact Support. 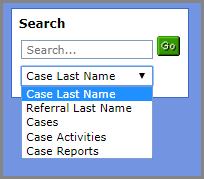 Use the search box in the lower left corner of your Workspace, to quickly find case, referral, or report and activity information. Search for any information that is displayed on the main “Case Screen” including medications, rate, worker name, etc. To quickly find information within a list from a side-menu view, press “Ctrl+F” to open this search box, which will appear in the upper right-hand corner of the screen. Type in the box, all or a portion of the text for which you are searching. The optional results, within the listing, will be highlighted for your potential selection.